Steve Buscemi makes hostage situations fun. 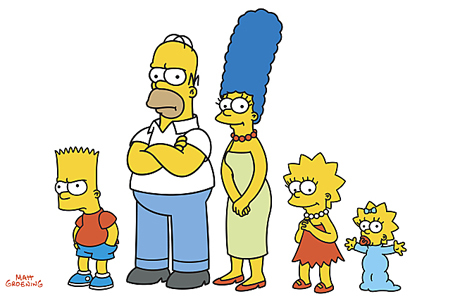 October 15, 2007 – The first two episodes from this season of The Simpsons were absolute clunkers. But the last two episodes have been pretty darn entertaining. This week, “I Don’t Wanna Know Why the Caged Bird Sings” delivered a fantastic guest appearance, two fun bonus guest appearances, and a story that was well paced and, more importantly, loaded with great laughs. As the episode began, we learned that Lisa would be receiving the Student of the Millennium Award at Springfield Elementary. Marge demanded that Homer not miss that event and that he had to arrive sober. This led to a great exchange between the two as they negotiated how sober Homer had to be: “American sober or Irish sober?” Homer’s final offer of “.10 with a stomach full of bread” was finally accepted. Homer arrived at the ceremony an hour and 45 minutes early, but Marge was a no-show. Instead, Marge found herself held hostage during a bank robbery. This was where we first met Dwight the bank robber, voiced effortlessly by Steve Buscemi. This is Buscemi’s second guest spot on The Simpsons after appearing as himself in “Brake My Wife, Please.” Here, the character of Dwight is given a very Buscemi-like appearance, most notably the buggy eyes. Thankfully, the actor apparently wasn’t bothered to have this feature comically referenced several times in the episode, concluding with a fun house mirror ballooning their bugginess to a hilarious extreme. Though the season is still young, Buscemi’s was the first guest voice of the year used to its fullest potential. The pacing of the episode did falter a bit near the end. Dwight found Marge and took her to the amusement park where his mother had abandoned him. It was Dwight’s attempt to have Marge show him the happiness of a day at the park that his mother couldn’t give him. The whole situation slowed the closing moments down far too quickly and just couldn’t deliver as many laughs as everything that came before it. And if that wasn’t enough, “I Don’t Wanna Know Why the Caged Bird Sings” gave us two more guest cameos. The first was Julia Louis-Dreyfus reprising her role as Snake’s girlfriend Gloria. The other was a recorded political plea from the Motor City Madman Ted Nugent asking voters to keep crossbows legal in our public schools. As he put it, “If we outlaw crossbows… who’s gonna protect our children from charging elk?” There were just too many memorable moments in this half-hour for it not to be a successful episode.